Retirement. Some people dread the thought while for others it can’t come soon enough. In either case this is a wonderful civilized concept that our modern society enjoys. At least it did. It is a fading concept and most of us should fear this. This is a sign that things are going backwards and we must fight this as hard as we can. The latest to be publicly scrutinized in our area is Bob Duffy. He collects a pension from having been police chief while also earning a paycheck for being mayor of Rochester. Some believe that this is wrong and I strongly disagree. He worked as a police officer then as a police chief and those jobs carry with them the promise of a pension. Many jobs offer pensions. Even more do not and this is a larger problem in my opinion. In either case what is at the root of all employment is motivation. All life is driven by motivation. Human society has risen to where it is because it found innovative ways to use this concept to it’s advantage. While it still has a long way to go give credit where it is due. We have come a long way in ten thousand years. So what does this have to do with retirement? Retirement is motivation. It attracts people to invest their lives in a company or a way of life. In short, it is a promise. What you do with that retirement should be up to you. If you choose to continue to work why is that anyone’s business? Bob Duffy earned his pension. He did his job and a promise was made to him the day he began. Break that promise and you open doors to hurt everyone else. I understand why people are angry especially when you consider that 80 % of our nation’s wealth is held by 1% of it’s population. That is an obscene statistic that doesn’t seem to get the press it deserves. People are tired of watching the wealthy live on their backs. So am I. 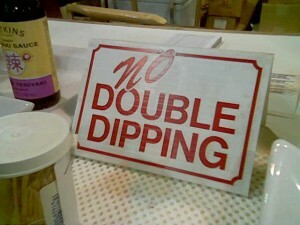 Double dipping is not one of those problems. The GOP would like you to think that however. If they make their base angry enough and stir up enough support they will stop this practice. But who will this hurt? The people that need it the most. It may seem unfair that Bob Duffy collects a pension while working in another job but you might see it differently when that person is you. Why should the pension you worked for be limited because you choose to (or perhaps need to) continue working or if you just want to do something else? A pension is a promise and breaking it is wrong. Choose your battles wisely. This is not one of them. I don’t quite understand what the controversy is: he retired from a pension job and now collects a pension. But just because you retire from one job does not prevent you from taking another and what you do after retirement has no bearing on the agreement you entered into when you got hired. Indeed…and you know who’s fanning the flames over this certainly. Good stuff John. It’s craziness to believe a person should forfeit a hard earned pension, just because they wish to continue to serve their community. Thanks for bringing this to light.